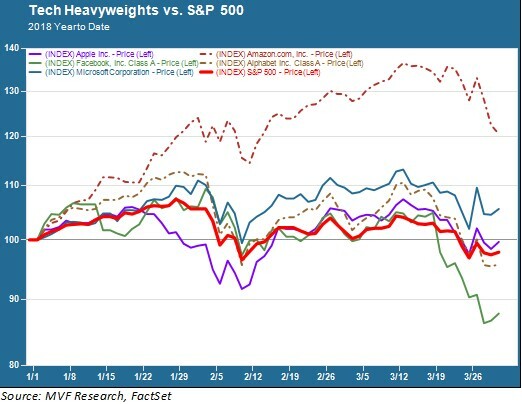 Global markets have lately been reacting to trade war histrionics from China, Europe and Asia where the view is that America's increasingly protectionist stance risks destroying the world trade system. While media-hyped issues such as trade imbalances can cause significant risk-adjusted valuations in different sectors, the effect is usually temporary, as we have so far witnessed. Far bigger and long-term damage can be wrought by increased government scrutiny on companies and entire industries. And nowhere would the damage be more keenly felt than if the government decided to muzzle the biggest and most important sector of the economy--technology. 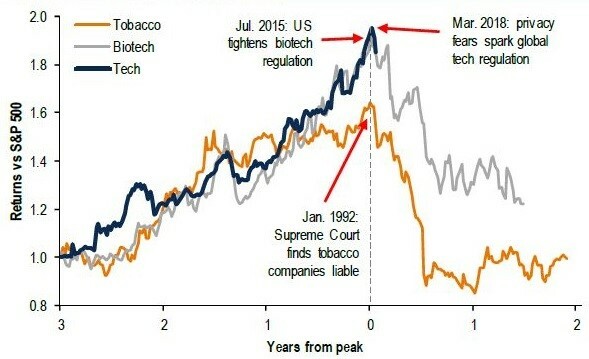 Waves of government regulation in the tobacco sector under George Bush's administration (1992) as well as financial and biotech (2010 and 2015) under Obama have led to years of chronic underperformance by stocks in those sectors. The tech sector is currently the least regulated industry, with just 27,000 regulations compared to 128,000 for financial services and 215,000 for manufacturing. But that could soon change for the worse if the senate decides to clamp down hard on Facebook. The company's CEO, Mark Zuckerberg, has already testified before congressional committees after revealing a consumer data scandal that affected 87 million user accounts. Meanwhile, pending U.S. and EU regulations--including increased online tax collection for companies such as Amazon--could lead to a four-percentage-point decrease in overall tech revenue. That's definitely a step in the wrong direction. The Facebook saga has not only dragged down the tech sector; it’s hit the entire stock market. Facebook is the 4th largest company in both the information technology sector and the S&P 500. Information technology accounts for an outsized 25 percent of the benchmark's earnings, an indication of how important it is to the market. America's entrepreneurial economy has generated interesting technologies such as drones and driverless cars, as well as apps that have fueled vibrant growth in the sharing economy. All that has been made possible by the First Amendment, which has minimized meddling and interference by the regulatory state. A proper balance in regulation is the key reason why companies such as Facebook, Google and Amazon are thriving while their peers in highly regulated jurisdictions such as Europe have remained stunted. It's also the reason why market capitalization of $6.4 trillion for U.S. tech stocks is considerably bigger than Eurozone's $5 trillion despite the latter boasting a bigger collective economy. Furthermore, the U.S. is expected to contribute 17.9 percent to world economic growth from 2017-2019, more than double E.U. 's share of 7.9 percent. The ongoing trend of regulation overkill could seriously hamper a lot of promising emerging technologies. For example, driverless cars are yet to become a reality on our roads due to regulation that has been dragging for years. That, despite their superior safety track record compared to human-driven cars. The same goes for commercial drones despite their proven ability to dramatically cut down on delivery costs. You go up by the stairs but come down by the lift--that's technology leadership for you.